Welcome to Lexulous - It's the fun word game you can play online. For free! - Also play solo / against the PC, sign up now! Lexulous a fun word game for all ages. Sign up to play. It's free and always will be. We’ve already started the game below, it’s your turn! 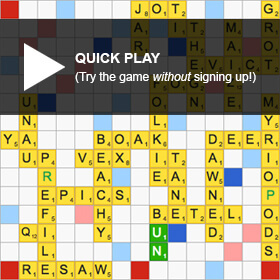 The OFFICIAL SCRABBLE PLAYERS DICTIONARY, THE OFFICIAL TOURNAMENT AND CLUB WORD LIST, and associated word lists are properties owned by Hasbro, Inc. in the United States and Canada, and are used with permission.